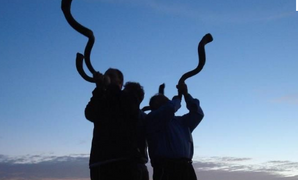 We need a shofar blower for our High Holy Days! But how shall we choose one? By means of the new Shofar Sho Good contest! It's set to take place at the band shell at Town Park in Bloomsburg at 4 p.m. Erev Rosh Hashanah, Sept. 9, if the weather is good; if it's not, we'll meet at the synagogue. It'll work like a game of Simon Says. We'll all start at the starting line. The rabbi will stand at the finish line and shout the different shofar calls. Everyone who gets the call right will get to take a step forward. The first person to reach finish line wins! There will be a prize, which is yet to be determined, for the first-place winner, which can be a member of the synagogue or a member of the general public. The first member of the congregation to pass the finish line will be our shofar blower for this year's services. We'll have shofars to lend - if we have more people than shofars, we'll hold multiple heats. Need tips on how to blow the different calls? Check out the video here. The only problem is it doesn't include the tekiah gedolah - basically, that's just the longest note you're capable of making. Want more information about the shofar? You can find that here.